Gimpy's version of the classic square circle with a more sophisticated look and updated features. 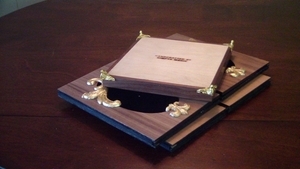 Similar to Mark Wilson's "Allakazam Hat", the load can be hidden at start behind the 4 panel outer box so that both boxes can be shown empty before they are placed on the base. The load chamber is a massive 8-½” x 4- ½” --big enough for a huge load of silks as well as a small fish bowl. Everything including the load chamber folds flat in a 2” tall stack. The piece is made of walnut and maple and accented with 18 karat gold leaf details. The inside is covered in black velvet so the illusion is possible in even the most demanding light conditions. The base is hallmarked. Very limited quantities. 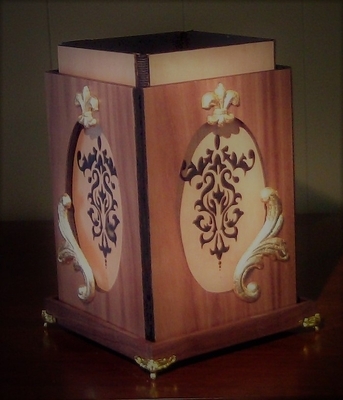 Total size is 7” x 7” x 11” tall.